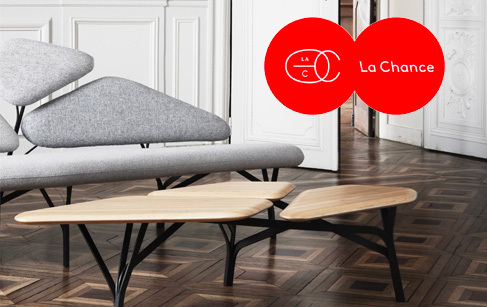 La Chance is a furniture design, rugs and lamp company. The brand features a cosmopolitan selection of work by the best designers of the new generation. The brand’s ambitious purpose is to provide a contemporary interpretation of the French ornamental and decorative furniture tradition. La Chance products are united by their emphasis on sophisticated, rich and distinctive design produced using noble materials. The brand reintroduces warm and uninhibited luxury and aims to break away from cold, impersonal and conceptual design. The result is a collection of strong personality products for disinhibited interiors. To create the collection, La Chance has gathered the best talents of the effervescent French ‘Nouvelle Vague’, but also seeks inspirations around the world, with talents from Italy, Netherlands, Israel, Sweden, Belgium, Poland and the US. The love of beautiful materials is the driver of La Chance creative approach. The brand uses only natural and durable materials such as solid wood, metal, marble, cork, leather, blown glass, or wool. La Chance develops strong identity pieces meant to last long, the kind of objects that 'get a patina' instead of ageing. All La Chance products are made by artisans based in Europe. Furthermore, La Chance exclusively works with wood proceeding from a sustainable exploitation certified by FSC (Forest Stewardship Council).